When we talk about industrial disasters, what comes to mind are the 1984 Bhopal gas leak tragedy from a pesticide plant in Madhya Pradesh, India, and the 1954 Minamata mercury poisoning disaster in Japan. We may have to add the recent poisoning in Pasir Gudang to the list. In the Bhopal tragedy, toxic gas from a pesticide plant leaked from storage tanks in the middle of the night. By the next morning, more than 2,000 people in the vicinity were found dead and thousands more in the following days. According to reports, faulty plant design and pipes, safety devices, poor maintenance of tanks, lax storage safety procedures and negligent staff were among the causes. Those who survived suffer from respiratory, neurological, gynecological, psychological, genetic and ocular issues. The Atlantic magazine states that it is the world’s worst industrial disaster, and after three decades, survivors are still fighting to have the site cleaned up. In the Minamata disaster, mercury poisoning affected thousands of people who consumed seafood contaminated by methyl mercury in wastewater. Methyl mercury was released from a chemical factory in Minamata. The high level of mercury in marine products caused neurological disorders, and sensory and auditory disturbances in people who lived near the contaminated area. The industrial pollution also resulted in environmental degradation, marine pollution and affected fisheries. The effects impaired low socio-economic groups and fishermen. And, now, in the 21st century, we have this grim case of industrial pollution in Pasir Gudang, Johor. 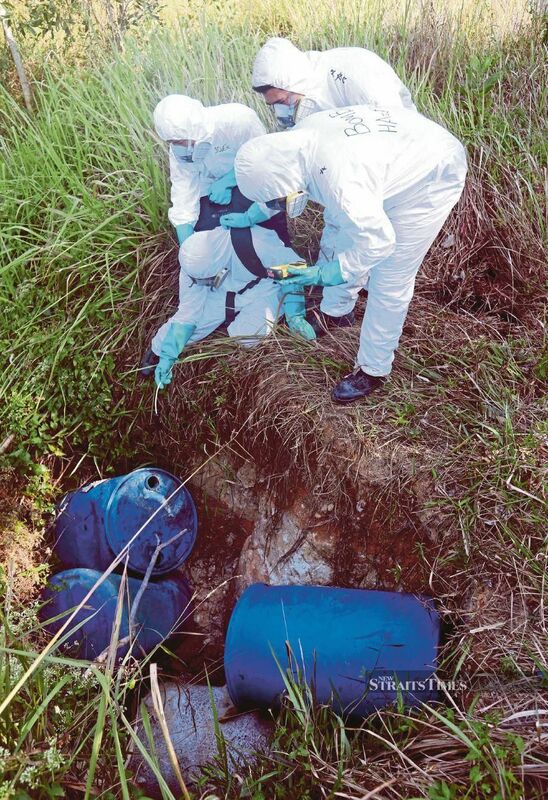 Initial reports stated that 2,775 people were affected by toxic fumes released from the illegal dumping of chemicals into Sungai Kim Kim. More than 100 schools remain closed at the time of writing. About 1,250 tonnes of soil, water and sludge samples had been collected from the river. Earlier, it was reported that 15 types of chemicals, including hydrogen cyanide, were found in air samples taken from the surrounding areas. Efforts are underway to prevent another wave of toxic pollution. But the question remains — how did the dumping of chemicals escape enforcement? Illegal discharge of factory waste is not new and has been going on for years. Many other rivers and numerous sites throughout the country have been polluted by industrial waste. Surely, we do not want another episode of chemical pollution to go wrong before we realise that it is too late for recovery efforts. The effects of past industrial disasters should serve as powerful reminders that people usually end up paying the price for the irresponsible and unscrupulous acts of the callous few. Effects of industrial disaster is widespread. The need to enforce environmental safety procedures and implement preventive strategies cannot be understated. Because for as long as enforcement is not stressed upon and procedures are not followed, pollution will continue and the lives of the public will be under threat. by DR S. MATHANA AMARIS FIONA. THE Association for Community and Dialogue is concerned about the high accident statistics provided by the Department of Occupational Safety and Health (DOSH). In 2017, 183 construction workers lost their lives at worksites. This translates to 14 fatalities for every 10,000 workers employed. As for accidents, DOSH states there were 42,513 throughout the country, giving an average of 116 daily (NST, Feb 17). It is hoped that with amendments to the Occupational Safety and Health Act 1994 Act, proposed to be tabled in Parliament this month, DOSH’s strengths and weaknesses could be deliberated in Parliament with the objective of enhancing its enforcement capabilities. DOSH policy and responsibility is about providing and maintaining a quality, safe and healthy workplace and system. Employers must ensure all staff receive relevant information, directives, training and supervision on how to carry out tasks in a correct manner that poses no risks to health. The Occupational Safety and Health Act 1994 Act was written for proactive action rather than when an incident has taken place. Has DOSH played its role effectively as a strong enforcement body? Does it have enough manpower? Does it play a critical role in monitoring critical public projects, or does it assume that contractors are competent in exercising their duties and hold them accountable only after a disaster takes place? The statistics of 42,513 accidents daily demands DOSH accountability. The Human Resources Ministry should review the current role of DOSH and evaluate its practice in line with its mandate. THE Association for Community and Dialogue, which is concerned about workers’ welfare, welcomes the proposed amendments to the Occupational Safety and Health Act (OSHA) 1994 by the Human Resources Ministry. This comes in the wake of a number of fatal accidents in the construction sector. Under the proposed amendments, the maximum fine for an offence, which is currently RM50,000, will be raised significantly. Under the amendments, which are set to be tabled in March, project owners and designers, alongside employers and main contractors, will be held responsible for construction safety and health. It is hoped that the new proposals, if adopted, will compel project owners, designers, employers and main contractors to work in a coordinated way in ensuring that safety rules are adhered to through work practices that set high safety standards. While such amendments are positive, there are general missing links on safety standards that need to be addressed. There is much focus on systems and penalties with less attention on human factors in safety and health. As a safety officer for 10 years in the manufacturing sector, I have come across accidents that are not caused by system failure but by psychological and physiological stress. For example, when I did an investigation on two veteran employees who lost part of their fingers in an accident involving machine rollers in a manufacturing plant, they told me that at the time of the accident, they were extremely stressed, tired and thirsty. Thus safety procedures were not on their minds. These workers have been operating and repairing the machine for 20 years, and had clear knowledge of safety measures and yet, all this failed in this situation. 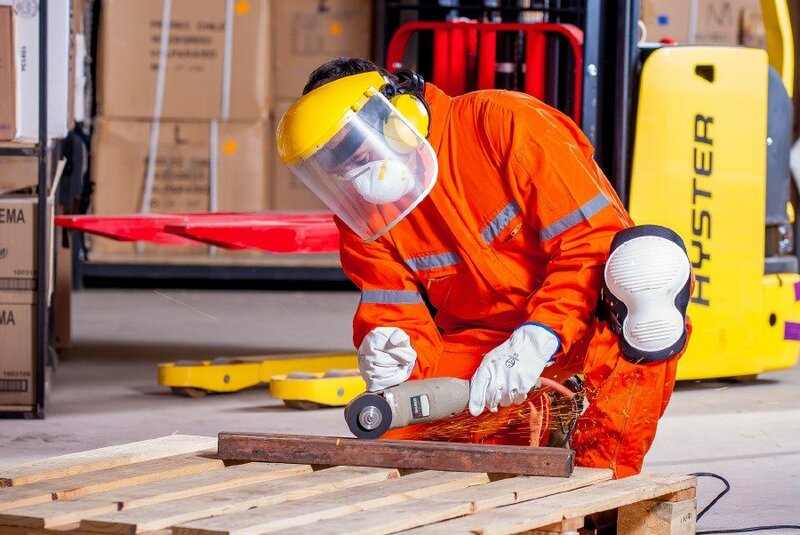 I have come across fatal injuries as a result of workers wanting to finish up as fast as possible, thus resorting to using inappropriate methods at work, which led to accidents. Safety procedures, training and risk assessment will not resolve safety issues. There is a need for technological devices such as sensors to detect the state of the physical body to signal risks. In an article last month in the Time magazine on the best inventions of 2018, under the heading “New way to protect workers”, a worker at a grocery distribution facility in New York strapped a sensor onto his chest. As he lugged heavy packs around the warehouse, the devices tracked how he moved. Eventually, it gauged that he was at risk of serious injury, in large part due to the amount of stress he was putting on his spine. So the worker met his manager, and together they came up with a solution: the worker was given a hook to help with lugging, so he wouldn’t have to bend over as much. This shows how safety rules and measures, complemented by technological devices, are effective and preventive in monitoring physical movements that can lead to injuries. These sensors can be used on workers in high-risk situations such in construction and manufacturing plants. There is need to embrace technology to complement safety rules, which requires a paradigm shift in the mindset of owners, designers, employers and main contractors. National Institute of Occupational Safety and Health (Niosh) chairman Tan Sri Lee Lam Thye says Niosh is ready to provide workers with exposure to the latest technology related to occupational safety and health. PUTRAJAYA: Employers in all sectors should boost automation applications for safety compliance, including in the use of safety equipment in line with the fourth industrial revolution ( Industry 4.0). National Institute of Occupational Safety and Health (Niosh) chairman Tan Sri Lee Lam Thye said employers should invest in the latest facilities and equipment related to safety and health at the workplace. “I hope employers will equip their workers with new technology and sophisticated equipment on top of a safe and healthy environment,” Lee said at the fifth Scientific Conference on Occupational Safety and Health (SciCOSH) 2018. He adding that adopting the latest technology could boost their competitive edge. He listed some of the technologies that could be applied, including personal protective equipment which had sensors or radio-frequency identification tags, which could collect data accurately and effectively. He said Niosh was ready to provide exposure to workers regarding the latest technology related to occupational safety and health. ISKANDAR PUTERI: Department of Occupational Safety and Health (DOSH) today urged employers to be more proactive in implementing initiatives to achieve zero-accident rate at the workplace. Johor DOSH director Dasuki Mohd Heak said it was not impossible to achieve this, as previously shown by companies and developers. “Firstly, employers must have the will; if you (employers) wish to achieve (zero-accident record), you must be willing to do it wholeheartedly. “Secondly, the companies must be willing to spend in order to ensure a safer working environment, and at the same time safeguard the welfare of their employees. 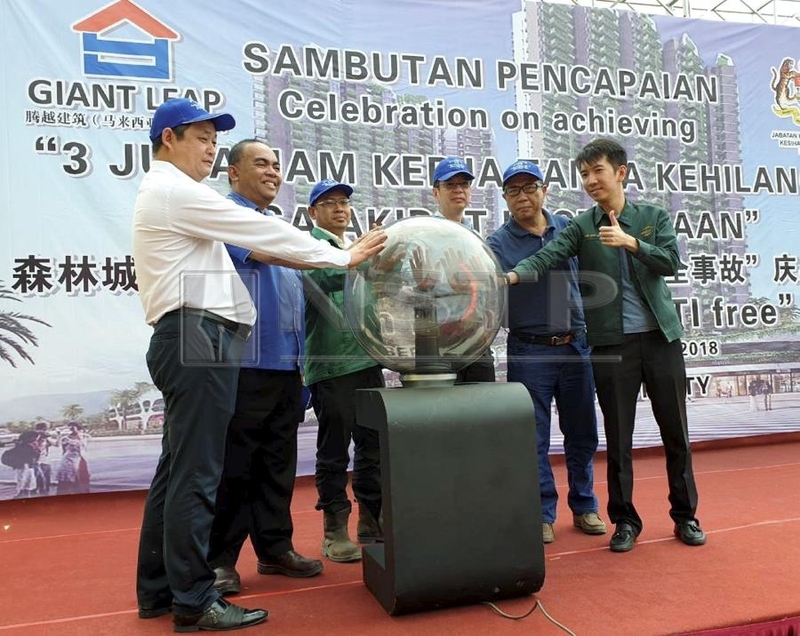 “Thirdly and most importantly, (there must be) excellent management because only the employers are capable of ensuring that a safe workplace could be achieved,” he said after launching Giant Leap Construction Sdn Bhd’s ‘Three million hours without Loss Time Injury (LTI)’ at Forest City’s Plot 4 construction site on Tuesday. Dasuki said DOSH encouraged the involvement of employers, safety and health practitioners; as well as employees, in the Accident-free Workplace Week; and Employees’ Safety and Health Meeting to increase awareness on the importance of practising preventive measures. THOSE in the tourism industry should adopt and implement good occupational safety and health (OSH) management practices to help reduce the number of accidents and health problems in the sector. 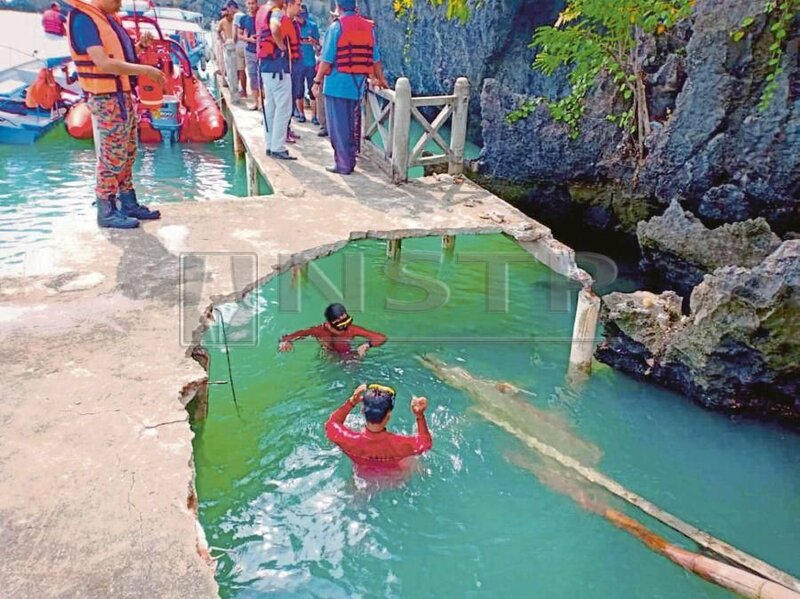 The recent incident where 12 people were injured when part of a jetty on Pulau Anak Tikus, Langkawi, collapsed on Oct 29 again highlighted our poor maintenance and safety culture. OSH for tourism industry must be practised for the safety of all. Jetties, especially wooden ones, must be frequently checked and safety audits done regularly. Such facilities are vulnerable to wear and tear due to frequent use, the weather and the corrosive sea water. This latest incident clearly shows that safety and health procedures were overlooked. The relevant authorities were negligent. Safety audits were definitely not carried out, or this would not have happened. Both federal and state governments should direct all relevant authorities and agencies to undertake safety audits of all jetties and other facilities and address the poor maintenance culture to prevent a recurrence. Over the years, the government has spent billions on the development of infrastructure and facilities for the country but what is regrettable is the lack of maintenance and commitment to safety. This has to be rectified and every effort must be made to inculcate the culture of maintenance and safety. Poor maintenance and safety culture in Malaysia can lead to unnecessary accidents which are a reflection of the Malaysian malaise, clearly manifested in inferior quality work, poor execution, inept management, poor maintenance and lack of ethics and integrity. Malaysia should no longer be known as “having first-world infrastructure but with third-world mentality”. DOSH to have eyes in the sky. GEORGE TOWN: Drones may be used to catch employers who flout laws that protect their employees’ safety and health. The Department of Occupational Safety and Health (DOSH) may soon have its “eyes in the sky” to check on large premises, especially construction sites, for signs of bosses not caring for their workers well enough. “Drones will be among the things that we are going to ask for an allocation to buy. He added that the ministry wanted to amend nine Acts, among them the Occupational, Safety And Health Act, to punish errant employers severely. “The law will ensure that DOSH be given more power against owners, developers, designers and contractors. The present Act only covers the main contractor. We want more people to be held responsible when there are wrongdoings,” he added. Foreign workers, he said, would also get a fair share of benefits through amendments to the Foreign Workmen Compensation Act. Lee: Make personal flotation devices available at drowning hotspots. 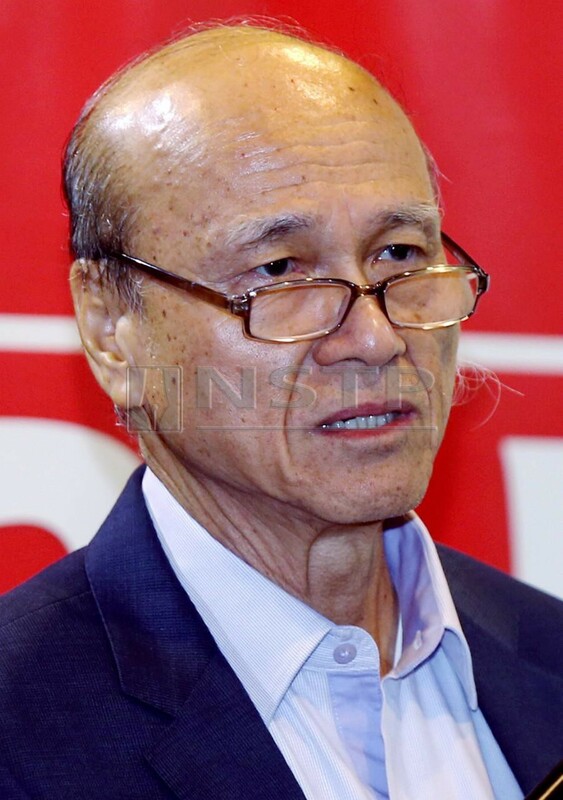 PETALING JAYA: Local council authorities must make personal flotation devices (PFDs) available at high-risk drowning locations, said Tan Sri Lee Lam Thye. “The government should also make it mandatory for local governments to place PDFs at high-risk locations for emergencies and also on recreational vessels,” said the National Water Activity Safety Council (WASC) member in a statement on Sunday (Aug 26). Lee’s call comes after three students drowned while taking a dip at Pantai Teluk Kalong, Kijal in Kemaman on Thursday (Aug 23). “It is rather unfortunate that drowning deaths still occur although the National Water Activity Safety Council has ordered the Fire and Rescue Department to be on standby mode at all the high-risk areas during the ongoing school holidays,” he said. Besides the PDFs, he said that the local authorities should adopt uniform water safety signages developed by the International Organisation for Standardisation known as ISO 20712-1:2008. “Warning signs should be installed at strategic places to remind the public on the danger of drowning in high-risk areas while damaged or vandalised signages should be replaced immediately,” he added. He said the Housing and Local Government Ministry, via the Fire and Rescue Department of Malaysia (JBPM), has since identified 12 hotspot locations nationwide as high-risk areas for drowning incidents. The locations in Selangor are Sungai SKC Kampung Timah, Sungai Tinggi, Sungai Gasi in Sungai Buloh, Sungai Chiling in Kuala Kubu Baru, Sungai Sendat waterfalls in Ulu Yam and the Semenyih Dam. Other high-risk areas are Sungai Kampung Batu Payung in Tawau, Sabah; Sungai Kampung Sabak in Pengkalan Chepa, Muara Tok Bali in Pasir Puteh and Pantai Nipah in Bachok, Kelantan, Lata Berembun waterfalls in Raub, Pahang; Chamang waterfalls in Bentong, Pahang and Teluk Bahang in Batu Feringghi, Penang. As a precautionary measure, Lee suggested that schools must create awareness on drowning by inviting representatives from WASC or relevant agencies to give a briefing on its danger before school holidays begin. Lam Thye: More needed to ensure safety at road works’ sites. PETALING JAYA: More efforts must be done to implement necessary safety measures at road works’ sites, said Tan Sri Lee Lam Thye. 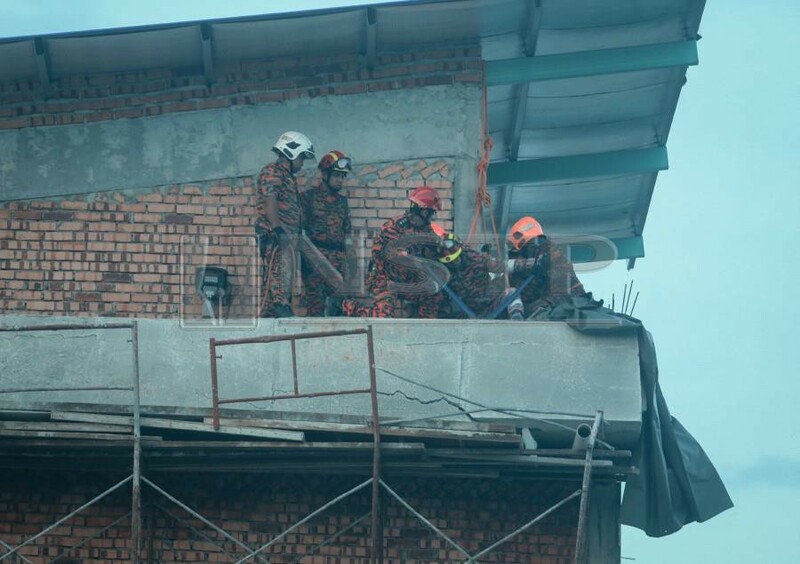 The National Institute of Occupational Safety and Health (NIOSH) chairman said the latest tragic accident involving Balakong assemblyman Eddie Ng on Friday could have been avoided if the contractor involved with road works had taken all the necessary safety measures at their work sites. “My condolences to Ng’s family. “Following his death at km11.7 of Grand Saga Highway, Cheras, the highway authorities have put up warning signs on road works being carried out,” he said when contacted on Sunday. “Why wait till a tragedy occur and then taking steps to rectify the situation. This is unacceptable,” he said. Selangor Traffic Investigation and Enforcement department chief Supt Azman Shariat had said previously that the risk of road accidents has increased due to the lackadaisical attitude of contractors and workers who have not fully complied with safety guidelines and procedures during road maintenance works. “I have been raising this subject over the years due to poor safety management of work sites during road maintenance works. “Whenever road works are being carried out, contractors and workers concerned do not give much thought for public convenience and safety,” Lee said. Lee said inadequate or poor warning signs and lighting especially at night has made it very hazardous or risky for road accidents. “As a road user I also want to express my disappointment and dissatisfaction over the manner in which most contractors carry out road digging works and leave the road badly resurfaced after completing their works,” he said. During the rainy season these work sites pose a danger to the public and accidents have occurred because of the lack of safety measures to warn motorists of the work in progress, he added. Lee called on the relevant ministry to conduct a thorough review of all safety measures in respect of road construction or maintenance works to prevent more losses of innocent lives on roads. KOTA KINABALU: Companies have been advised to now go for ISO45001, which is the world’s first international standard for the management system when applying for the occupational health and safety management system (OHS MS) certification. National Institute of Occupational Safety and Health (NIOSH) chairman Tan Sri Lee Lam Thye said ISO45001 was the first OHS MScertificate issued by the International Organisation for Standardisation (ISO) on March 12, 2018. ISO45001 is expected to replace the widely-used British Standard for Occupational Health and Safety management (OHSAS18001). “With this new international standard, OHSAS18001 will be obsolete. For OHSAS18001 certified companies, they are given a 3-year period before March 12, 2021 to migrate to ISO45001,” he said after attending NIOSH Sabah Regional Office Hari Raya Aidilfitri open house at a resort here yesterday. Lee said NIOSH Certification Sdn Bhd, which is a subsidiary of NIOSH, also provided ISO45001 certification services and had organised seminars in Selangor, Johor and Sarawak. A similar seminar will be held at Hotel Promenade Kota Kinabalu on July 5. “NIOSH Certification is a certification body that has been accredited by the Department of Standards Malaysia. “Among the services offered include OHSAS18001 and MS1722, ISO9001 Quality Management System, ISO14001 Environmental Management System, ISO22000 Food Safety Management System, and MS2530 Malaysian Sustainable Palm Oil (MSPO),” he said. He said NIOSH Certification had also been approved by the Malaysian Palm Oil Certification Council as a training centre for MSPO Auditors in June 2018. “NIOSH Certification is willing to provide services and collaborate with plantation and mill owners and associations in the palm oil sector to obtain MSPO certification by the end of 2019 as targeted by the government,” he said. According to him, the certification awarded by NIOSH Certification meets international standard and it had already opened an office in Kota Kinabalu on August 1, 2016 led by manager Muhammad Fadhil Abu Bakar. “The regional office is responsible for promoting and providing the best service for customers in Sabah and Sarawak,” he said. Lee also announced that NIOSH would offer special incentives to institutions of higher learning and those who pursue the Technical and Vocational Education and Training (TVET) programme to get the safety and health officer (SHO) certificate from NIOSH. He said NIOSH is also willing to form a strategic collaboration with any OSH association or organisation as its business partner to provide OSHtraining and consultancy services. You are currently browsing the archives for the Occupational Safety and Health Administration (OSHA) category.